Great idea! I have often wrapped a pie with a tea towel for the hostess to keep! That is so pathetic looking. I mean Miss Sadie, not the bread. Poor girl. If we lived closer we would love to invite her over. The bread is lovely, I'm impressed and very cute/clever idea for wrapping. I'm making your wonderful acorn squash tonight. I loved the whole dinner you made, it looked so yummy. I'm also making carrots for Mr. Picky because that is what he chose at the grocery, but just in case I'm keeping a side of Italian bread crumbs ready. I'll let you know. Love this idea!! Nice work! I love how dogs think they have it so bad! My dog is pouting right now because I won't let her get on MY bed. She thinks it is her bed and I'm trying to break that habit. Your posts about food always make me so hungry! I love homemade bread and the fabric is a great idea! What a wonderful idea. I'm going to have to try that. I love that idea! I make bread quite frequently and I have lots of fabric lying around -- I'm definitely going to try this. Thank you! I love the combo of the blue checks and the green ribbon. I bet your hostess was thrilled to get that loaf of bread. Poor Sadie Kate. My dog is a big pouter, too. That is a great idea to do with the bread. Perfect idea for the holiday! Your dog is beautiful! I have the same dog, shelty and the same colors! Gorgeous! What a yummy and beautiful gift to give! I've always been intimidated by bread making...even though I love to bake! I'm so glad to meet a sister...and that you're following, yay! I am too! You make the best bread Miss PPC, and then put it in the prettiest packages! The ribbon is the perfect touch. Baking is rather soothing for us, good for the soul. Does it seem that way to you? Cute wrapping idea! If we lived near each other I would invite you to dinner all the time just for homemade bread - I absolutely love it! 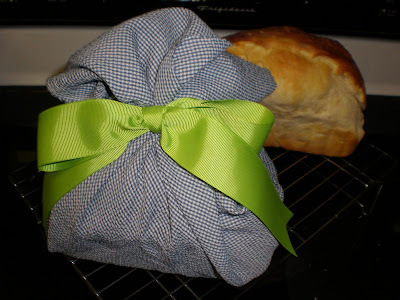 Your homemade bread gift is wonderful and the presentation is so cute! 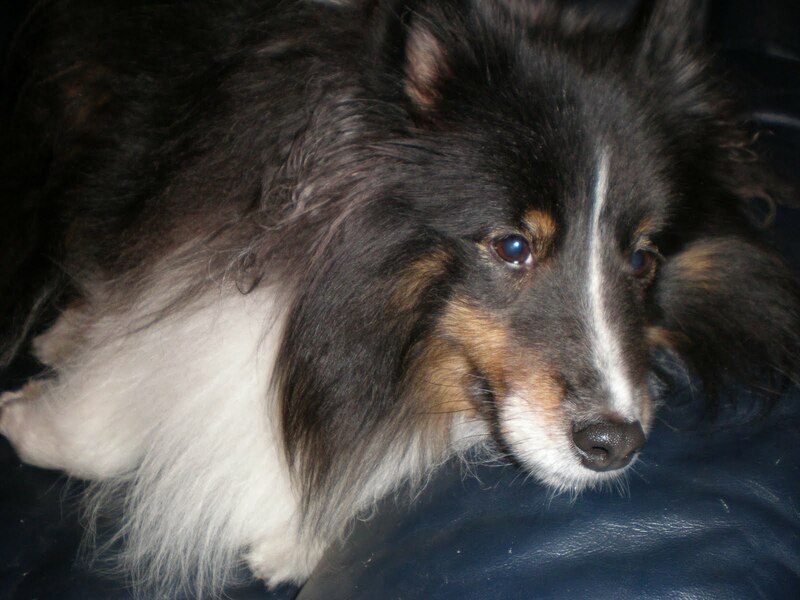 Love that little doggy! Beautiful, and the recipient can always use the fabric again - go green! Guess what?!?!?! Your package was mailed today=) I'm going to email you the tracking number. I made sure to get that. You've been waiting on this forever!!!! What a pretty way to present the bread! !